Within these covers lie the regulations which keep the Knighthood strong. It is the responsibility of every Knight to understand the meaning of Honor, and with this in mind; King Vinas Solamnus put forth a series of guidelines by which to live. Since that time, that work, called the ‘Measure’, has been revised, edited, added too, and cut. It now covers 37 large volumes, hardly what one can consider convenient. With that in mind, I’ve sat down to write what will be, in comparison, a handbook for a Knight of Solamnia. Herein lay those things that are most important to a Knight of Solamnia, albeit, it is advised for every Knight to understand the Measure in its entirety. I believe the words contained within these pages will help the Knight understand his responsibility in this world, and what it is he strives for. A multitude of sources went into this work. I derived information for this text from numerous source books including the World Book of Krynn, The Book of the Fifth Age, and The Complete Book of Paladins. Various novels were also used, including The Legend of Huma, The Oath and the Measure, Dragons of Summer Flame, and Morte D’Arthur. Were I to thank all the authors who put their heart and soul into these works I would be writing all day. So basically, I’ll simply say that to everyone who has ever written a story or work on either Dragonlance or Knights in general, thank you for enriching my life. And of course, my father, Leslie Wolfswinkel, the most honorable man I ever knew. Note: Some of the information presented herein is provided from an out-of-character (OOC) standpoint and should not always be quoted directly while in character (IC). Background: Petitioners are required to write a background description on storyboard. At minimum this note should establish the character’s bloodline and nationality but should contain as much information as possible. A background must be approved by a Solamnic Immortal (Kiri-Jolith, Habbakuk, or Paladine), a High Knight (Leaders), or an active Recruiter before the Page can be inducted as a Squire. While Recruiters can approve a background for the purposes of induction, no Recruiter may deny a background without the approval of either the Grand Master, a High Knight, or a clan Immortal. If it is so requested that an Immortal judge a background and no Solamnic Immortal rules on a background within 1 week of its posting, another Immortal (approved by an Implementer) may judge the background. Those petitioners whose backgrounds do not establish them as of Solamnic blood will not be permitted to join the Order of the Sword. Those petitioners whose backgrounds do not establish them as Nobility will not be permitted to join the Order of the Rose. If a petitioner writes a background that restricts them from an Order, the individual should be informed and permitted the opportunity to rewrite his background if he so chooses. Description: A character’s description should include basic details such as hair color and style, eye color, build, height, clothing, etc. This must be approved along with your background. In order to be considered full members of the Solamnic clan, members must be knighted. Prior to Knighting, the entrant is considered a Squire and is subject to discharge without trial. Further, the Squire may request a discharge and be granted one without question. Upon being knighted, the clan member is entitled to a trial before discharge. Knights have made a lifetime commitment to the Order and will not be discharged unless proven guilty of a transgression against the Measure. This document contains rules that did not exist in the previous installment. In a case where a knight holds a rank he is not eligible for, these new rules do not apply for the duration of the knight holding said rank. If a knight somehow leaves the position he holds due to the Grandfather Clause, he may not again attain the position without meeting these restrictions. Some requirements are flagged as “NO GRANDFATHER CLAUSE”. In this case, all knights are required to meet the requirement with all haste or risk losing the status he has not met the requirement for. A page is any petitioner to the order who has not yet achieved the necessary requirements for entry but has the potential to do so. This includes those who have yet to display requisite martial skill (level 15+), complete a formal faith conversion to an appropriate religion (god change if the petitioner does not worship one of the Triumvirate), or have not followed the appropriate path of training (need to recreate as a permitted class). Pages are expected to live up to the same standards as squires in respect to obedience, but most commands should be intended to guide the page in the appropriate direction in training. Pages should be equipped as soon as possible, taught how to level properly, and informed of what the requirements for entering the knighthood are. Any page that is unlikely, for any reason, not to qualify to enter the order as a squire should be asked to remake and provided with everything he needs to start his journey toward knighthood as soon as possible. Among the most important elements of the Knighthood are its squires. Squires represent the future of the Order, and need be given full attention at all times. Upon entry into the Order, any person joining begins his career as a Squire of the Crown. They are assigned a Patron Knight, whose responsibility it is to see that the squire is well trained. The Patron Knight trains the Squire in all aspects of Knighthood; this includes combat, the Measure, upkeep, organization, religion, honor, etc. In return for this training, the squire owes ultimate fealty to the Patron. The squire will unquestioningly obey the command of the Patron, and serve him with loyalty. The squire may be assigned to quite a bit of drudgery work, but this will serve to install the proper work ethic in the Squire. It is the Patron’s word that makes the Squire a Knight. The Patron shall, when the squire has completed training, petition a Knightly Council for Knighthood for his squire. The Council will present the squire to the Knighthood, asking for objections. Should no objections arise, the Squire is knighted. If there are objections, a trial is held to answer those charges. All training is overseen by the High Warrior. He is the only knight permitted to override a Patron’s order, and the only knight permitted to petition a knightly council without the patron’s approval. Any petitioner must have reached 100% in all of his class’s key skills, while reaching at least 85% in all secondary skills, in order to be knighted. See the charts below for class-specific details on these. He must also have his class’s minimum natural hit points per level. Though the High Warrior or patron knight may ask more of the squire to attain knighthood, a Knightly Council may not approve any squire for knighthood who has not met these requirements. In order to attain knighthood a squire must have completed all required tasks set by the Measure and his patron. The patron (or the High Warrior in his stead) must submit a petition for knighthood to the High Council. Upon the Council’s next meeting, they will decide the young knight’s fitness for Knighthood. Prior to Knighting, the Council shall permit an opportunity for anyone who has reason for the squire not to be knighted to come forth. If no questions are raised, and the petitioner has met all requirements of squirehood, he is inducted into the Order of the Crown, granted ennoblement, and given the rank of Knight Postulant. All squires shall be knighted at a properly sanctified place, such as the Whitestone Glade, a temple of one of the Triumvirate, or the chapel. If the Council is held in the meeting hall, the knightings shall be conducted after all other business is completed and the congregated have been moved to the chapel. Proper knighting ceremony begins with a prayer by the ranking Knight Clerist present, calling upon the Triumvirate to bless the proceedings. The highest ranking knight present will conduct the ceremony further, asking that all of the squires kneel. The squires will be asked to then to draw their swords. While still kneeling, but with head up, each squire shall draw his sword and hold it in his right hand with the hilt over the heart and the blade vertical. Each squire shall then bow their head and hold their sword by the blade with the hilt offered toward the presiding knight. The presiding knight, if a practical number of squires are present, takes each squire’s sword and taps him on each shoulder with the blade. If too many squires are present to permit this, the presiding knight may use his own sword, or request that the squires hold a formal salute to the holy symbol of Paladine. The presiding knight then directs the squires to rise as Knights of Solamnia. This concludes the ceremony. The Solamnic Knighthood is divided into three Orders, each of which has its own role and purpose. Contrary to popular belief, no Order outranks another, though a knight of a higher order who holds the equivalent rank does hold sway when necessary. For example, while a Sergeant of the Sword (clan level 4) outranks a Sergeant of the Crown (clan level 4), Steward of the Crown (clan level 5) still outranks that Sergeant of the Sword (again, clan 4). This means that order, as applied to rank, is nothing more than a tie breaker, and even then that does not apply in the case of High Knights, who are considered equals. All Knights begin their careers in the Order of the Crown. Crown Knights emphasize the virtues of Loyalty and Obedience. They are often used as home guards and standing armies, while other Orders have responsibilities that require them to spend a good deal of time away from combat. A Knight of the Crown should be always ready to fight, never letting down their guard. It is left to other orders to see to the administration, foreign affairs, and more mundane aspects of Knighthood. When the Knighthood meets and marches, the Order of the Crown takes its place on the left of any formation, signifying its place as the Shield of the Knighthood. Defenders of the Crown are those knights who have dedicated themselves to the Order of the Crown. These Knights commit to remain faithful to the Order and not seek membership in any higher order, and thus have special duties and responsibilities. In peacetime, a Defender acts as constabulary within Solamnic lands. He is investigator and law enforcer, tracking criminals and bringing them to justice. For minor crimes that he witnesses, or can otherwise prove, he is trusted to act as judge, jury, and executioner. In wartime, the Defenders act as garrison troops in the Solamnic homeland. While the knighthood is multinational, spanning the breadth of Ansalon, the Defenders have taken solemn oaths to defend Solamnia first and foremost. A Defender of the Crown must be a Warrior, Monk, or Ranger. By joining the order, he immediately gains a 1 rank promotion and outranks all non-defender Crown Knights of the same clan level. Becoming a Defender is a lifetime commitment and no Defender may petition for entry into the Order of the Sword. Note that the above class restrictions apply only to the Defenders of the Crown, not to the Order of the Crown as a whole. Any class permitted into the Knighthood may remain in the Order of the Crown. When the Knighthood goes to war, it is the Order of the Sword who leads the assault on foreign lands. Knights of the Sword are most active in seeking out evil, confronting it where it lives, and destroying it. Whereas Crown Knights focus on defending Solamnic territories, the Sword Knights focus on freeing other people from the grips of tyrannical rule. When the Knighthood meets or marches, the Order of the Sword takes its place on the right side of the formation, signifying its place as the sword arm of the Knighthood. Knight Clerists are those Knights of the Sword who have dedicated themselves to the spiritual growth of the Knighthood. The most pious of Knights join this order (Order of Clerists within the Order of the Sword) and foreswear any right to petition for advancement into the Order of the Rose. They are Clerists for life. In peacetime, a Knight Clerist acts as priest to the Knighthood, and the martial arm of the Holy Order of Light. In wartime, Knight Clerists take up the role of Hospitaller, caring for the infirm and those knights and soldiers who have taken wounds on the battlefield. A Knight Clerist must be a Cleric, Paladin, or Templar. By joining the order, he immediately gains a 1 rank promotion and outranks all non-Clerist Sword Knights of the same clan level. Becoming a Clerist is a lifetime commitment and no Clerist may petition for entry into the Order of the Rose or be nominated to hold the rank of High Warrior. The High Clerist must be drawn from the Order of Clerists. Note that the above class restrictions apply only to the Order of Clerists, not to the Order of the Sword as a whole. Any class permitted into the Knighthood may petition to join the Order of the Sword. Knights of the Rose are rare, and are often the elders of the knighthood. Rose Knights take up many of the more mundane duties of Knighthood, such as managing land, taxing its residents, and hearing civil disputes. Rose Knights participate in world affairs, diplomacy, and make up the Advisory Council to the High Council. Considering this important role, it’s no wonder most believe that it is the Rose Knights who lead all other Orders. When the Knighthood meets or marches, the Order of the Rose aligns itself at the center of the formation, signifying its role as the heart of the Order. While the High Council is, indeed, the supreme governing body of the Knighthood, the authors of the Measure saw it as prudent that the writers of the Rule not be the same as the appliers of the law, and hence established the Rose Knights Council. Members of the Rose Knights Council have dedicated themselves to the Order of the Rose and the Virtue of Justice. In peacetime, the Rose Knight’s Council oversees trial and discipline both within the Knighthood and within the nation of Solamnia. They act as the judicial branch of the Solamnian governing body. In Wartime, the Rose Knight’s Council manages relations with foreign powers, negotiating treaties, alliances, and advising the High Council on matters of war. A Council member must be a Paladin or Templar. By joining the order, he immediately gains a 1 rank promotion and outranks all non-Councilor Rose Knights of the same clan level. Becoming a Councilor is a lifetime commitment and no Councilor may be nominated to hold the rank of High Warrior or High Clerist. Note that the above class restrictions apply only to the Rose Knight’s Council, not to the Order of the Rose as a whole. Any class permitted into the Knighthood may petition to join the Order of the Rose. Lord Officers: the generals and strategists of the Knighthood. A squire of the Crown is not officially considered part of the Knighthood and therefore does not hold a military rank among the Knights. However, for in-game functionality, mechanics, and purposes Squires of the Crown are clan rank 1 within the Order of the Crown. Novitiates, or novices, are those who are generally new to an Order. Those holding these ranks are still Knights, but this rank is given as part of the transitional phase when moving from Crown and Sword to Sword and Rose respectively. The first rank held by a Knight of the Crown is that of Knight Postulant. No other Order has this rank, as a postulant is newly knighted, and while he has proven himself worthy of Knighthood he has yet to serve in any significant manor. Postulant is a rank rarely held for long as most soon prove themselves worthy of promotion. Some knights never hold this rank at all by proving themselves while they are Squires. Knights are the backbone of the Knighthood and the largest percentage of the Knighthood hold this rank. See the section Path to Knighthood for more information on the steps to being Knighted. See Rank 2 for Sword & Rose. The status of Knight Officer is the status at which a Knight is first placed in a leadership role. He is typically placed in a Company as second-in-command. A Knight Officer is called a Sergeant of his Order. When a knight becomes an officer he has proven himself capable of leading others. A Knight’s first real command is held once the status of Subcaptain is achieved. Subcaptains are called Stewards of their Order. A Steward is given command of a Company which is usually made up of 1 Knight and 5 Men-at-Arms. Note: If a Knight wishes to advance from the Order of the Crown to the Order of the Sword or from the Order of the Sword to the Order of the Rose, it is usually done before advancing beyond Steward. Once a Knight reaches the rank of Captain, he has usually decided to stay in the Order he currently serves. A Knight who holds the rank of Captain in his Order is usually placed in command of a Regiment which is usually 5 Companies (around thirty men). A Compgroup is made up of 7 Regiments, which is around 210 men, and is led by a Knight Commander. A Commander is known as a Warden of his Order. Once a Knight is raised in rank above Warden he becomes a Lord Officer within the Knighthood. It is at these ranks where a Knight is placed in command of thousands of Knights and leads whole armies on the field of battle. The lowest of the Lord Officer ranks is that of Warrior Lord. A Warrior Lord is called a Marshal of his Order. A Marshal usually leads a Shield (5 Compgroups) which is more than 1,000 men. Clan rank 8 adds the Recruiter function to the player. See related helpfiles in-game for more about these. Note: While Recruiters have the ability to promote clan members up to their current rank, it is discouraged without direct consent from the candidate’s respective High Knight. A Lord Knight, called a Lord of his Order, commands a Quadron which is made up of 4 Shields (more than 4,000 men). There are only a handful of Lord Knights at any one time depending on the strength of the Knighthood. Clan rank 9 maintains the Recruiter functions of the player. See related helpfiles in-game for more about these. Also note that simply having ‘Lord’ as a title doesn’t necessarily mean that person is Rank 9 within the Knighthood. Above the Lord Knights are the three High Knights. The High Warrior commands the Knights of the Crown, the Knights of the Sword are lead by the High Clerist, and the Rose Knights are lead by the High Justice. Each High Knight commands the Army of his Order. At full strength, each army consists of 6 Quadrons (approximately 24,000 men); however, the Knighthood has not been at full strength since before the Cataclysm. Promotion to the rank of 10 adds the Leader function to the player. Besides the obvious difference in rank, Leaders have all the in-game commands of a Recruiter but also possess the ability to discharge members of the clan. See related helpfiles in-game for more about these. Promotion is handled by the High Knights alone (with the exception of the Grand Master) and only within their Order. No other knight is authorized to promote other knights without the express permission of their High Knight. High Knights may issue standing orders that their Recruiters may promote within the Order or may authorize a specific Recruiter to handle promotions, but this will vary from High Knight to High Knight; that decision is reserved for the High Knight alone. At the head of the Knighthood is the Grand Master. The GM personally commands the Grand Circle of Knights on Sancrist. He is also the supreme military commander of the Solamnic Knights leading all three Armies through the High Knights. The Grand Master is afforded the right to promote within any Order though common usage of this right is discouraged. Occasionally, a knight might be charged with the position of Acting High Knight or Acting Grand Master. This is always when there is a vacancy and the Order (or the clan as a whole in the case of AGM) is unable to fulfill the minimum number of votes for a legal election. The Acting High Knight has all of the authority of a real High Knight except that he can be overruled within his order by either BOTH other real High Knights or the Grand Master. An Acting Grand Master may NOT promote within any order except his own and does not hold veto power over the High Council. Note of Etiquette: It is considered extremely bad form to ask for or demand a promotion, even if “only joking”. Doing so will likely slow your progress through the ranks. A few have even been expelled from the Knighthood for this. Advancement (not promotion) means to go from one Order to the next, rather than from rank to rank. Not every Knight has the goal of achieving the level of Knight of the Rose, but with advancement comes prestige and a change in role. When a Knight wishes to advance, he must first reach the appropriate level of martial skill (level 50 to advance from Crown to Sword, 75 to advance from Sword to Rose), then present himself before a knightly council. If advancing to the Order of the Sword, the council must include at least one Marshal of the Sword and Crown or higher (i.e. recruiters or leaders). If advancing to the Order of the Rose, the council must include at least one Marshal of the Rose and Sword or higher. If the council does not have the proper membership, the Knight must wait until the council contains the proper representation. The knightly council reviews the candidate’s actions during his time in the Knighthood thus far. If his actions are found acceptable, then according to the Measure the Knight is given a quest to prove himself worthy (Quest of Virtue). If the Knight feels he was misrepresented or unjustly found wanting in his actions, he may take up the matter before the council. The Knight’s quest will not be given until the matter is resolved. The quest is the final determining factor in whether the knight will be advanced. According to the Measure, the quest is a witnessed deed of heroism and valor that upholds the virtues of Knighthood. When the Knight has completed his quest, he returns to the knightly council with evidence that his trial has been a success. If the quest is not witnessed and there is not irrefutable evidence, the knight’s advancement is denied. Advancement will also be denied if witnesses report the Knight did not act according to the virtues of Knighthood during the quest.As always, the Knight has the right to answer his accusers before the Council. The quest itself is at the discretion of the presiding council (see above under Advancement for council requirements), but usually includes one major goal along with three minor goals. Minor goals are usually broad, such as uphold the Virtue of Courage, and it is left to the Knight to judge what fulfills that goal. The major goal will always involve a journey of some kind, just as Vinas Solamnus and Huma Dragonbane both traveled far in search of their quarry. At the end of this trek, there will be some challenge, such as defeating a Knight of Neraka in single combat, rescuing a kidnapped child from the lair of a chromatic dragon, or freeing a town from the grips of a despotic ruler. When the Knight presents his case before the Council, and all witnesses have been heard and evidence presented, the Council shall discuss, in private, the fate of the knight. If the knight meets the prowess requirements (level 50 or 75 respectively), then he must only gain approval from the representative of his Order and the Order he seeks to enter. However, a unanimous vote from all three Order representatives and the Grand Master can override this requirement (allowing someone who does not meet level requirements to advance). Should the council unanimously find that some deeds done prior to the Knight petitioning for advancement fulfill all requirements for the Quest of Virtue, the assigned quest can be waived and the Council may proceed to voting on the Knight’s acceptance into the new order. Virtues are traits that exemplify the highest standards of morality, decency and duty. They comprise the Knight’s personal code. Though all Knights adhere to all of the virtues described below, the Measure is split into three sections — each Order concentrating on a particular section. Some virtues are not tied to an Order at all; those appear at the end of this list. Loyalty and Obedience epitomize the Knights of the Crown. Loyalty is unquestioning faithfulness to the cause of a higher power. Knights of the Crown view loyalty as a tribute to be justly and voluntarily rendered. The Order of the Crown renders loyalty to the order’s founding god Habbakuk, to those who, by decree of the Knightly Council, deserve the Knights’ protection, and to those who suffer under evil’s weight. Obedience is the practical manifestation of Loyalty. A Knight of the Crown unquestioningly obeys those on the List of Loyalty, a list of rulers compiled by the Knightly Council who deserve the loyalty and obedience of the Knighthood. The specific responsibilities of a Knight of the Crown include tithing income, aiding any knight who requires help, and service to the nations and leaders on the List of Loyalty. Knights of the Sword act as warriors for the gods of Good, upholding the purest ideals of heroism and courage. Heroism is the self-sacrificial fight for the cause of Good. Heroic deeds include strengthening the weak, enriching the poor, freeing the enslaved, exonerating the falsely accused, championing the defenseless, and aiding fellow knights in need. Courage is the readiness to die honorably in the fight for Good. Courageous acts include facing evil fearlessly, defending the honor of the Knighthood, defending the honor of a fellow knight, and protecting the defenseless and weak. A Knight of the Sword must surrender all personal wealth (save what is needed for upkeep) to the Knightly Coffers (OOCly this is at the complete discretion of the player;however, ICly this is mandatory), pay homage to Kiri-Jolith and the gods of Good each day, eagerly engage evil opponents in combat (not retreating regardless of the enemy’s strength), protecting the weak and defenseless, and forswear the use of Knightly “powers” for unrighteous reasons. The Order of the Rose embraces honor guided by justice and wisdom. Honor is the allegiance to one’s Oath to defend the cause of Good. Honorable deeds include sacrificing oneself for the sake of others, refusing to surrender to or ally with an evil foe, defending the Knighthood till death, protecting the lives of fellow knights, and living true to the Oath in all matters. Justice is the heart of the Measure and the soul of a Rose Knight –to render to every creature, person, or god his or her due. Just acts include aiding those who are less fortunate, donating all wealth to the Knightly coffers (save that which is needed for personal upkeep), worshipping and obeying Paladine and the gods of Good, fighting injustice with courage and commitment, and seeing no life is wasted or sacrificed in vain. Wisdom is the prudent use of one’s abilities and resources to uphold honor and render justice. Courtesy involves more than merely following the rules of etiquette. It’s also an attitude, a way of presenting himself to the world. A Knight carries himself proudly, maintains self-control, and accepts ill-mannered behavior with grace. He follows social customs to the best of his ability. He is polite and deferential to friends and strangers alike. The Knight gladly shares his meager funds and belongings with anyone in need. If he owns two swords and an elderly hunter has none, the Knight offers one as a gift. He will give his last crust of bread to a hungry child, even if he must go without food for the rest of the day. He is also generous of spirit, always willing to lend an ear to a troubled companion or acknowledge a friend’s accomplishments with lavish praise. The Knight engages in productive activity at all times. He works diligently and hard until he completes the job at hand. When not working, he studies, exercises, or practices his combat skills. He considers leisure activities, small talk, and vacations to be time-wasting folly. The Knight will not, however, work himself to death. Rest is essential to continued productivity, and with such in mind, the Knight shall take time out of each week in which to relax and rest his body and mind. A Knight always tells the truth as he knows it. He may decline to speak or choose to withhold information, but he will never intentionally mislead anyone — not even his enemies. He may ask permission not to answer a direct question, but if pressed, he’ll tell the truth (although he may frame his answers in a way as to withhold vital information if necessary). Though a Knight doesn’t make promises lightly, once he gives his word, he always keeps it. Of chief importance to a Knight of Solamnia are his strictures — a set of inviolable rules that the Knight must follow at all times. A Knight must maintain standing in the eyes of Paladine and the gods of Good. This requirement means that a Knight is sworn to promote and exhibit Goodness and Order in all facets of his life. The heart of this ethos is the belief in a system of laws that promotes the welfare of all members of society, ensures their safety, and guarantees justice. A Knight rejects the unholy magic of the mage whether that of a member of the Conclave or that of a renegade. A Knight is not to be outright cruel to such individuals, but is advised to avoid contact with such persons. Sometimes contact is unavoidable, and this should be judged on a case by case basis. A Knight has no interest in wealth for its own sake. He seeks spiritual, rather than material, satisfaction derived from serving his faith and his Order to the best of his ability. Still, the Knight recognizes that a certain amount of money is necessary to survive. Rather than forego money altogether, he retains enough wealth to meet his worldly obligations and sustain a modest lifestyle. Edicts include commands, instructions, and traditions a Knight is pledged to obey. A Knight doesn’t choose which edicts to follow; rather, he pledges to follow any and all edicts issued by the Knighthood and his patron Knight. 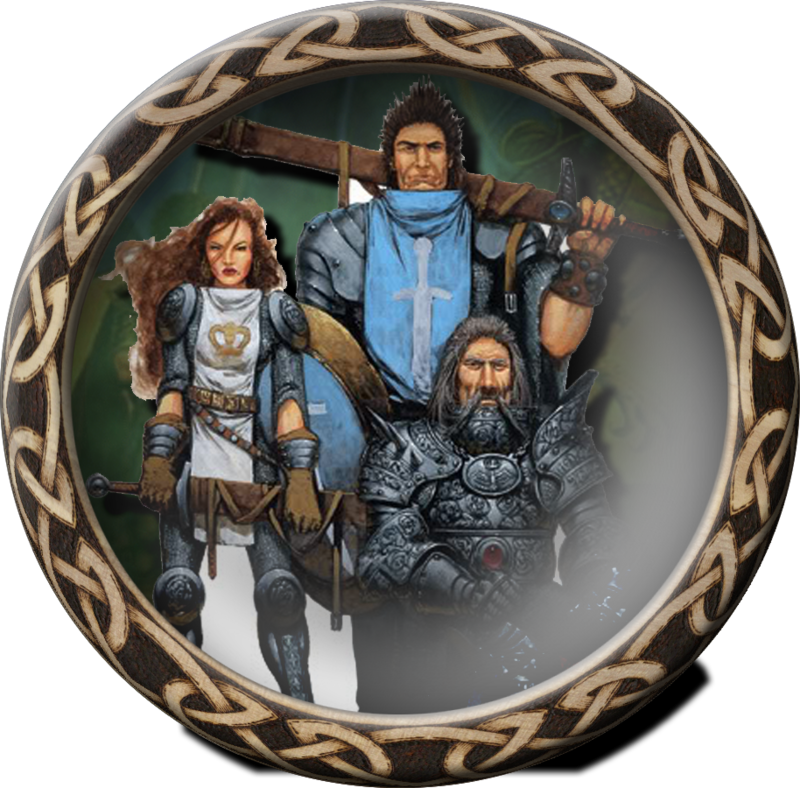 A Knight of Solamnia is the mortal representation of Paladine, Kiri-Jolith, and Habbakuk. As such, a Knight acts in a way that honors the Triumvirate and all of the gods of Good. A Knight acts to defend the faith in the gods of Good, defending their values, and acting as the military branch of the church. Knights who have been assigned a Patron Knight owe fealty to that patron. In return, the Patron Knight owes responsibility toward to Squire. A Patron Knight may assign regular tests to measure the squire’s intelligence, integrity, or skill at arms. The Squire is responsible for care of the Patron in old age. The bond between Patron and Squire never ends, and the relationship between these two is of utmost importance. This bond should never be betrayed. A Knight of Solamnia has pledged fealty to the Knighthood as a whole, and must follow the Order’s edicts. Lastly, a Knight performs military service when he is called upon. A Knight donates the use of his stronghold for any legitimate purpose. This includes, but is not limited to, housing soldiers, entertaining government guests, storing supplies, and military purposes. The term Knightly Council refers to any body of knights authorized to oversee trials, tests, and questions of Knighthood or honor as a judgmental body. It is important to understand the difference between a Knightly Council, the Whitestone Council, and the Rose Knight’s Council. A Knightly Council can be formed to hear a knight’s trial. A council is made up of three members, one from each Order, all of at least the rank of Marshal (clan level 8). If necessary, a High Knight may appoint a knight not of Lord Knight to act in a Lord Knight’s stead. Even then, the knight must have attained the rank of Captain (clan level 6). Knightly Councils generally oversee mundane operations of knightly circles on a day to day basis. Most trials are conducted by Knightly Councils, while the most contentious are often appealed to the Rose Knight’s Council. The Whitestone Council is similar to the Rose Knight’s Council and most Knightly Councils in that it is not a judiciary body. Also, unlike Knightly Councils, they are not temporary bodies brought together for a specific purpose. The Whitestone Council is the administrative and legislative branch of the Solamnic Knighthood. The Whitestone Council is sometimes referred too as the Council of Four, the Knightly High Council, or the Grand Circle. Its members are the High Knights of each Order plus the Grand Master of the Solamnic Knighthood. The Whitestone Council oversees advancement between orders, and knighting, as well as changes in law, and amendments to the Measure. The council can convene as a judicial body because, minus the Grand Master, it does qualify as a Knightly Council. Elections can be called for by any Lord Knight when a Whitestone Council position (High Warrior, High Clerist, High Justice, or Grand Master) is open. The Lord Knight need not be in the same Order as the opening. It is the responsibility of the Lord Knight to inform the electorate of every Knight eligible for election to the position. While any active Knight may attain the position of Grand Master, there are certain requirements in the other Orders. First, a Knight must have been or currently be a member of the Order he or she wishes to lead. A Sword Knight, for example, may not become High Justice, but may accept the position of High Warrior. An active knight is one who has maintained an average of no less than 4 hours per week over the course the two months prior to the election. Should any knight be absent for 30 consecutive days prior to be elected but before being declared High Knight, his election is declared invalid and a new election may be held. In all elections, there must be at least a period of one week permitted for voting, although the period may be longer. No Knight may claim victory in an election until at least one week has passed. An election is not considered valid unless a quorum has been reached. The quorum is 3 votes for any High Knight position, and 9 votes for the position of Grand Master (Solamnic Immortals may alter the vote requirements based on the number or availability of voters). All positions on the Whitestone Council are held for life, unless the entire Council, save the member in question, votes to replace the Knight. The Knighthood’s Immortals reserve the right to declare a Council member inactive, by the above definition, and call for a new election. However, if no election can be held for whatever reason, the inactive knight officially holds the position until a knight can be elected to replace him. The High Warrior is the commander of the Order of the Crown. He is responsible for promotions within that order, and must approve of any knight’s petition to advance out of the Order and into the Order of the Sword. The High Warrior’s primary responsibilities include oversight of squires and training, planning and preparations against any possible invasions of the Solamnic homeland, and leadership against invading armies. The High Warrior is elected by the Order of the Crown. At least three votes must be received, and squires may not vote. Any Knight who is or has been a member of the Order of the Crown may be elected High Warrior except those who have committed themselves to the Order of Clerists or Rose Knight’s Council. The position is held for life, or until the entire Whitestone Council agrees that the position must be refilled. The High Clerist is the commander of the Order of the Sword. He is responsible for promotions within that order and must approve of any knight’s petition to advance into the Order of the Sword from the Order of the Crown or any knight’s petition to advance out of the Order of the Sword into the Order of the Rose. The High Clerist MUST be drawn from the Order of Clerists. The High Clerist is the spiritual leader of the Solamnic Knighthood and is responsible for the oversight of all religious ceremony conducted by the Knighthood. Further, he is the commander of all offensive assaults into foreign territory. The High Clerist is elected by the Order of the Sword. At least three votes must be received. Any member of the Order of Clerists is eligible to be elected High Clerist. The position is held for life, or until the entire Whitestone Council agrees that the position must be refilled. The High Justice is the commander of the Order of the Rose. He is responsible for promotions within that order and must approve of any knight’s petition to advance from the Order of the Sword into the Order of the Rose. The High Justice must be drawn from the Rose Knight’s Council. The High Justice is the supreme judge and lawyer in Solamnia and is responsible for overseeing the disciplinary structure within the knighthood as well as the legal system in Solamnia. He heads the Rose Knight’s Council and selects which justices will sit on which courts. Additionally, the High Justice is the chief ambassador and diplomat for the Solamnic Knighthood. The High Justice is elected by the Order of the Rose. At least three votes must be received. Any member of the Rose Knight’s Council is eligible to be elected High Justice. The position is held for life, or until the entire Whitestone Council agrees that the position must be refilled. The Grand Master is the Commander-in-Chief of the Solamnic Knighthood and supreme executive officer. He is responsible for oversight of the entire knighthood and all operations therein. He is also the ruler of the nation of Solamnia in the absence of a King. The Grand Master is elected by the knighthood as a whole. At least nine votes must be received. Any Knight of Solamnia is eligible to be elected Grand Master. The position is held for life, or until the entire Whitestone Council agrees that the position must be refilled. Bills may be submitted to the Whitestone Council by any knight. The Whitestone Council votes as a whole with the Grand Master acting as speaker. The Grand Master has no vote, but has the option to veto any law passed by the council unless the vote was unanimous. Amendments to the Measure must be approved by a unanimous vote, and then approved by at least 2/3rds of the knighthood as a whole. A minimum of 9 votes must be cast for this vote to be considered. Overall, the Knighthood’s leadership structure is very similar to that of the United States federal government. The Whitestone Council acts as the legislative branch, very similar to the role of Congress. The Grand Master can be equated to the President, including his position as Commander-in-Chief and veto power. The Rose Knight’s Council acts as the Supreme Court, where challenges to interpretations to the Measure are heard. Members of the Rose Knights Council have dedicated themselves to the Order of the Rose and the Virtue of Justice. In peacetime, the Rose Knight’s Council oversees trial and discipline both within the Knighthood and within the nation of Solamnia. They act as the judicial branch of the Solamnian governing body. In Wartime, the Rose Knight’s Council manages relations with foreign powers, negotiating treaties, alliances, and advising the High Council on matters of war. Becoming a Councilor is a lifetime commitment and no Councilor may be nominated to hold the rank of High Warrior or High Clerist. The List of Loyalty, compiled by the Rose Knight’s Council and approved by the Whitestone Council, is a list of nations and organizations that the Knighthood agrees to help protect. This is not a political process; these groups must be viewed as good and in line with the values of the Knighthood. Nations must treat their citizens with respect and permit freedom. Organizations must be committed to a cause in line with the cause of the Knighthood. Members of the List of Loyalty owe no allegiance to the Knights of Solamnia and do not necessarily have a military trespass treaty or formal alliance. The High Council is not permitted to ask a nation a return favor for being on the List of Loyalty. When a member of a clan on the List of Loyalty is attacked, it is the responsibility of the Knights of the Crown to drop anything they are doing to help if at all possible (within Player Killing rules). Knights of the Sword and Rose are encouraged to do the same, but are not required. In wartime, Knights of the Crown who control units should make every effort to ensure that regions within nations on the List of Loyalty do not fall into enemy hands. The List of Honor is a list of Knights whose lives are an inspiration to other Knights. Knights are added on an annual basis, and no more than 3 Knights may be added per year. At the December monthly meeting, the council shall compile a list of deserving ex members and submit the list to the mud as a whole. Each player on the mud is permitted one ballot, on which he can list 3 choices. Any knight who is both in the top three in total votes and appears on at least 60% of the total ballots is inducted onto the List of Honor. The deadline for votes is the first day of the new year. To remove a Knight from the List of Honor requires 4 votes from the High Council and the approval of all Solamnic Immortals. For this reason, the Council is encouraged to focus on submitting the names of inactive or retired Knights who hold little chance of being dishonored. Role play is an expected part of life as a Solamnic Knight on AnsalonMud. Every character is expected to spend the majority of his or her time in character, even if nothing extraordinary is occurring. Small talk and everyday conversation is a great way to explore the depths of your and other people’s characters. As a ten year player on Ansalon, I have harvested some of the greatest friendships I have via role play, with great knights such as Demilon, MacFie, Bharish, Xenith, Xethan, and countless others, all of which I came to know through in character interaction as Denbrook and Dirketh. This section is intended to help you better develop your character into his own personae. While many players prefer to play characters as extensions of themselves, the best role players are able to incorporate elements outside of their own personalities to create truly unique characters that they grow to cherish. I strive to inject something new into each of my characters, and because of that, each of them have a special place in my heart, and I remember them all fondly, but for different reasons. Dirketh, a wise and grandfatherly old knight; his son Denbrook, a stern and commanding soldier; Derrick, driven and ambitious; Thomas, light hearted and roguish; Drekar, scheming and isolationist. Each of these characters were Knights of Solamnia, and strove to live up the the Oath and the Measure, but each had his own way of pursuing his goals. In this section I will outline knightly archetypes and personality traits that can be incorporated into a concept to create a more complete picture in your mind. I will outline some of the more abstract aspects of how the knighthood is run, and also explore some cultural aspects of the knighthood and Solamnia in general. Please do not interpret this as as a how-to section. None of this information is required or even all that important; it is simply a place to start if you are hard pressed to find a direction for your knight to take to make him or her stand out from the crowd. Remember, the Knighthood is thousands strong, with tens of thousands of Auxiliary members who don’t even rank as squires. This fact alone establishes you as something special. The very fact that you are a PC means that your character is someone with the potential to be legendary. PCs make up a tiny percentage of knights; the Sturm Brightblades, the Huma Dragonbanes, the Vinas Solamnuses, and the Jaymes Markhams. Think big in your goals, and establish a character with the drive to accomplish them. Traditionally, Solamnic names are very simple, though widely varied. The lands of Solamnia are vast, occupying a full quarter of the entire continent of Ansalon. Thus, names very by region. So don’t be too concerned about what kind of first name you give a character. Chances are it will make sense somewhere in Solamnia. I like to stick to traditional English and French names, which have a sort of knightly ring to them (Reynald, Jacques, Thomas, Stephan, Duncan). Irish and Scottish names also sound very good with the Sir prefix (Connel, Cormac, Tristan, William). Indeed, any western European name is very well suited. The difficult part begins after that; the surname. There are traditionally four forms of surnames in Solamnia: those that indicate lineage, those that indicate origin, those that indicate occupation, and those that are simply nicknames. The first, and most common, is simply the use of the prefix ‘uth’. Uth translates directly from old Solamnic to “Son Of” but has come to mean “daughter of” or “ancestor of” as well. While usually uth precedes the name of a knight’s father, a particularly prominent name might be passed down for several generations, or even made the family’s permanent surname, as in the uth Wistan family. While Stephen’s son Jeffrey might introduce himself as “Jeffrey uth Stephan”, if Jeffrey’s grandfather Tristan was a high ranking and highly respected Knight of the Rose, Jeffrey may chose to continue the use of that surname, “Jeffrey uth Tristan”. In formal writing knights will often call back two generations, and Jeffrey would sign his name “Sir Jeffrey uth Stephan uth Tristan”. Note that knights of Ergothian lineage might use the ap prefix rather than uth. Additionally, a family who chooses to adopt a member’s name as a permanent surname for all ancestors to adopt may change uth to the traditional Mar, meaning “of the house of”, so “Jeffrey MarStephan” would be “Jeffrey of the house of Stephan”, or simply, “of House Stephan”. By contrast, many families drop the prefix altogether, simply adopting the surname, such as in Jaymes Markham. The second manor of surnaming indicates place of origin. The place can be specific, such as di Solanthus, indicating a specific city, or general, as in di Heartlund, indicating an entire province. It can also indicate a landmark, castle, or even something vague, such as “of the hills”. If it is a specific place, such as a castle, city, or province, the prefix “di” (meaning ‘of’ or ‘from’) is often used. The “di” is dropped if the individual is of the area’s ruling family (the duke of Solanthus would simply be called “Solanthus”, not “di Solanthus”, while other knights from that town would retain the “di”. This applies to those knights who either rule the designated area, or are in direct lineage of the ruler, such as a son or grandson, but not family members who are not potential heirs, like cousins or uncles). The third manor of naming is less common among knights than it is among the general populace, and that is using occupation. Often it is translated into Old Solamnic, ancient Ergot, or ancient Istarian, but the meaning still relays the same message. Many surnames, such as Porter (one who transports goods), Smith (one who forges things from metal), and Thatcher (one who repairs thatch roofs) sometimes make their way into the Knighthood, but few remain there long before one of the other naming conventions supplant it. The final, and often most prestigious, manor of gaining a surname is through nicknames. Often a nickname will remain with a family for many generations, eventually being adopted as a permanent surname. Tallbow, Brightblade, Stormguard, Pathwarden and other names that seem to bare some special meaning fall into this category. Sometimes, such as in the case of Aaron Tallbow, and exceptional archer who was killed when he accompanied the Heroes of the Lance in recovering the Dragon Orb at the Ice Wall, are only around for a single generation as a nickname for that knight alone. Others, such as in the case of the Brightblades, are earned by one member, and passed on to a deserving heir. If a third generation also earns the nickname, it can be expected to remain for quite some time in honor of the family’s honored past. Other nicknames are simply matters of convenience. If two John’s grow up in the same village, the village will attempt to differentiate between the two by granting one or both a nickname. This is usually a very simple name, such as “Big John” and “Little John”, or “John the Tall” and “John the Short”. Note: The following text was written prior to a recent timeline update. The selection has been left attached for thoroughness. Current time can be found in-game by simply typing ‘time’. Any questions regarding the current posture and demeanor of the Knighthood can be fielded to an <L> or <R> of the Solamnic Clan or any Immortal. The Knights of Solamnia arose during the Age of Dreams, more than two millennia before the War of Souls. The three Orders of Knighthood emerged from the remnants of the tyrannical Ergothian Empire to become the most enduring force for good on Ansalon. The beginnings of the Knighthood lay with a noble of the oppressive and wicked court of the Emperor of Ergoth in the year 1801 PC. Vinas Solamnus, the Praetor of the Imperial Armies, Cavalier of Ergoth, was dispatched to crush a rebellion in the eastern province of Vingaard. For nearly a year, Solamnus delivered defeat upon defeat to the under-equipped rebels, but winter brought his campaign to a halt. During this lull he began to examine the cause of the rebellion and came to empathize with the rebels. Vinas delivered a rousing speech to his army, and turned their swords on the Empire. Solamnus launched a series of campaigns that came to be known as the War of Ice Tears. The peasant rebels became the bulk of his army, with his original Ergothian soldiers as the backbone. The rebel army pierced deep into the heart of the Empire and laid siege to the capital city of Daltigoth. Solamnus was able to infiltrate the city and turn the populace against the Empire, forcing him to sue for peace. The province of Vingaard gained its independence, and would from then forth be known as Solamnia, for its new king. Over the years, yet more people threw off the yoke of Ergothian rule and wished to join the young nation. Vinas saw this as impossible, the customs and ideals of the various peoples being too different. With no common ground on which to unite his new kingdom, Solamnus embarked on what would come to be known the Quest of Honor. After weeks of wandering, sailing, and wandering some more, King Solamnus found himself in a small glade occupied by a great block of black granite. Solamnus collapsed in a heap, exhausted and near starved from his long trek. He prayed to Paladine for an answer as tears rolled down his cheeks. It was then that the Triumvirate revealed themselves. The gods Paladine, Kiri-Jolith, and Habbakuk gave King Solamnus a vision of the three orders of knights, each sponsored by one of the Triumvirate. From Habbakuk came the Order of the Crown — dedicated to the virtues of loyalty and obedience. From Kiri-Jolith came the Order of the Sword — Knights of great courage and heroism. From Paladine came the Order of the Rose — dedicated to justice and honor guided by wisdom.These knights would unite all of the northern lands with the eastern Solamnic provinces into one great people. During the vision sent to Vinas Solamnus, the gods of the Triumvirate changed the piece of black granite into a pillar of pure white crystal. This blessed and sanctified the glade, sealing the Gods’ pact to watch over the Knighthood. The Whitestone Glade is now the most sacred sight of the Solamnic Knighthood. 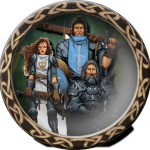 The Knights of Solamnia are now the oldest and most revered order of chivalry that has ever existed on Krynn. They sprang from humble beginnings: a couple dozen poor noblemen who helped protect the young Solamnian nation. In just 20 years time, the order grew to over 700 full knights, plus thousands of peasant footmen and squires. The oath of a Solamnic knight, “My Honor is My Life“, is well known from Sancrist to Mithas. The oath is that which a knight is born for, lives for, and eventually dies for. It is a birthright, and was once the Knighthood’s sole guide. Though most know of the Oath, few know much about that which defines it: The Measure. Often thought of as useless dusty tomes to those who don’t know better, this definition of honor is a sacred text to the Knights of Solamnia, as indispensable as the oath or a good stout shield. The Oath “Est Solarus oth Mithas“, or “My Honor is my Life“, is the Oath that is the foundation of Knighthood. It is the guiding light for all Knights, an Oath so simple, yet so all encompassing so as to provide a path in any conceivable situation. The Virtues of Knighthood, as laid forth by the Measure, are the foundation of honor. The first writings that would become The Solamnic Measure of Knightly Conduct, or simply The Measure, occurred in 1770 PC, about 5 years after the formation of the Knights of Solamnia. Vinas Solamnus and his knights agreed that a formal rule must be written to define the behavior of a knight of Solamnia. Solamnus assembled the highest ranking Knights, priests of the Holy Order of the Stars, and much of the highest echelon of Solamnian nobility. All met in Jansburg, a small fishing village on the banks of the Vingaard River. The Grand Master at the time, Lord Fredrick di Lytburg, had suggested the location due to its seclusion, to assist in keeping the council on task. That committee, known as the Jansburg Council, spent 6 miserable days locked in a cramped room at a local inn. What was actually said is lost because no formal transcript was kept. Only the product of the council, known as the Primitive Measure of Knightly Conduct, can tell us of the results. The document numbered 74 pages total, and covered such topics as courtly etiquette, the habit of a Knight, and the original virtues of Knighthood. Evolution of the Measure Subsequent generations of Emperors, Churches, and Knightly Councils amended and added to the original document. At first, the process was slow. Solamnus and his successors did not take amending the Measure lightly, and felt that much of a knight’s actions should be influenced by his dedication to Paladine and the gods of good, not the writings of men. When Emperor Vinas Arianus uth Malik abdicated and abolished the Solamnian throne the Knighthood was granted autonomy from the general nobility. Changes to the Measure occurred more frequently under the High Council’s authority. When a new question of honor was presented, the Council would add its new ruling to the Measure. Whenever a knight required the proper interpretation of a passage in the Measure, the Council would attempt to ‘clarify’ the passage by adding to it. Eventually such additions succeeded not in clarifying, but in confusing future Councils. By the War of the Lance, the Measure had grown to 37 thick, hardbound volumes. Every conceivable aspect of the life of a knight was detailed, including 75 pages devoted to how to properly saddle a horse, and an entire chapter regarding proper care for one’s sword. Clearly, this was too much instruction for any knight to follow in its entirety. So caught up in these rules and laws did the knighthood become that the spirit of the Oath was lost, replaced by an obsession with keeping to the precise word of the Measure. Nobody could hope to assimilate all of the strictures set forth, yet all Knights were expected to adhere to them. Prior to the War of the Lance, most of the elder knights had become convinced that it was the proper image that would restore the knighthoods glory. In the minds of these Knights, the Order had to present an outward appearance of absolute perfection in manor. Immaculate courtly grace and flawless presentation were key.Through acts of propriety the Knight would shine so brightly that the people would be blinded to the past, and forget their hatred. Instead, such strict adherence to the written law created only an unbending Order, incapable of adapting to new times. There were other contributions to the downfall of the Oath. During the turmoil following the War of the Lance, many knights went into hiding, and many forswore the knighthood altogether. Some of these turned to banditry, others simply slipped away to start new lives elsewhere. Even to their families, these men rarely mentioned their former life. Meanwhile, the Knighthood itself continued to crumble from within. When rules became more important than honor andrank became more important than duty, power struggles erupted among the knights, creating factions that did little but bicker and scheme. It took the ultimate sacrifice by Sir Sturm Brightblade to quell the internal strife. Please note, this is in our FUTURE, as the current time is set to 345, the companions re-meet at 349 and the war ends 351. Solamnics in our time are still less ‘revised’. After the War, the revised Measure after Sir Sturm’s sacrifice at the Tower of the High Clerist and the fire of the Oath was rekindled; the Knighthood was revitalized. The victories that lead to the defeat of the Dragonarmies in the War of the Lance revived public support for the knighthood. In the ensuing years, the knightly roll grew to its strongest point since the cataclysm; well over 500 knights. Fearful that peace might reignite old feuds, Lord Grand Master Gunthar uth Wistan set about revising the Measure in such a way that the spirit of the Oath would never again be buried in meaningless detail and petty arguments. The Revised Measure of Knightly Conduct was a much less intimidating document. No longer did the Measure cover such frivolities as how to saddle one’s horse before battle or the appropriate length of time to hold a knightly salute to an enemy. Now the rules were less specific. Most of that which was not part of the original document was done away with while that which was essential was either clarified or rewritten altogether. The new Measure gave the Knightly Council much more leeway in judging a knight. Everything is taken on a case by case basis and judged on its own merits. Though honor and chivalry is still of utmost importance to a knight, a knight is now taught to follow his heart and the teachings of the gods in such matters, not the long silent voices of dead politicians. Today the knights follow a code of chivalry as righteous as ever. The oath resonates as strong as ever among those who believe in it. The Measure is still here as well, guiding the knighthood when men cannot provide an answer. Few knights who have called upon the Measure for guidance have come away unsatisfied. Indeed, some spiritual scholars now believe that Lord Gunthar’s pen was guided by Kiri-Jolith, so relevant are its passages. Much of what defined the Knighthood was destroyed since the first cataclysm, and that which was regained after the War of the Lance was then torn away during the Chaos War. Today’s knights are left to pick up the pieces of shattered glory. But though the Knighthood’s lands are sundered and its brotherhood splintered and scattered about Ansalon, the knights still have the Oath and the Measure. Surely, this will lead them all in the right direction. This document is researched and compiled by A.J. Dembroski (old Kiri-Jolith) with contributions from Mike Kelly (Saige). Many sources went into the creation of this document, many of them things I referenced from my own head. Some of the above is referenced verbatim from the source, but most is either revised or original words. Many events, histories, added details, etc. are places where I took the liberty of expanding on the written material where gaps existed, notably the History of the Measure, which is a completely original article (that was once featured on dragonlance.com and dl3e.com until they started requiring precise references due to Wizards of the Coast’s policy toward fanfic). Nevertheless, there are those sources I can directly credit, and shall here with title and author where available. “The Primitive French Rule”, which was the real world version of the Measure, written by various Catholic Church leaders to guide the Knights of the Temple, or Templars.